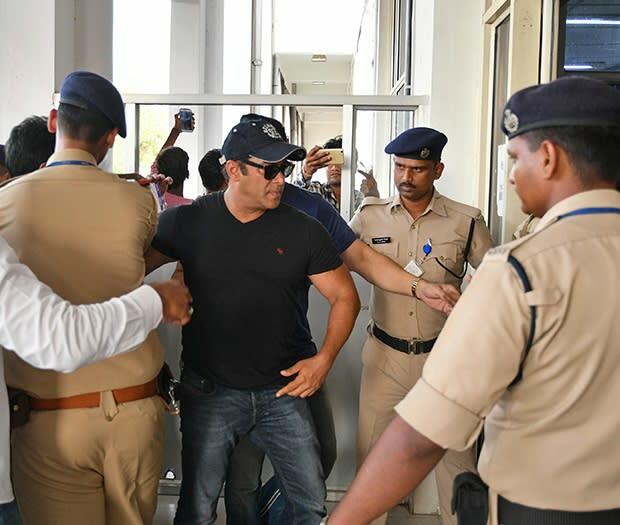 New Delhi — A court on Saturday granted bail to Bollywood superstar Salman Khan while he appeals his conviction on charges of poaching rare deer in a wildlife preserve two decades ago, a welcome development for thousands of fans who greeted their hero with songs and firecrackers. Khan was convicted Thursday and sentenced to five years in prison and was immediately sent to jail. On Saturday, Judge Ravindra Kumar Joshi ordered him to sign a surety bond of 50 000 rupees ($770) before he was set free from the jail in Jodhpur, a town in western India. Hundreds of Khan's overjoyed fans danced outside the courtroom and chanted "We love you, Salman." His sisters, Alvira and Arpita, were present during the hearing. Carrying big garlanded posters of Khan, the fans set off firecrackers and sang songs from his Bollywood movies as some of them chased his car heading to the airport. The scenes were more intense outside his Mumbai residence in India's entertainment capital. Thousands of fans waited for hours and lit up the sky with fireworks as Khan reached his home. Flanked by his father and other relatives, he came to the balcony of his apartment with folded hands and waved, thanking them for their support. He retreated after signalling his fans to go home. Four other Bollywood stars accused in the case - Saif Ali Khan, Sonali Bendre, Tabu and Neelam - were acquitted Thursday. They were in the vehicle that Salman Khan was believed to be driving during the hunt in 1998. Tabu and Neelam both use just one name. Khan says he did not shoot the two blackbuck deer. The heavily muscled actor was acquitted in two related cases. His attorney Mahesh Bora has challenged the conviction and sentence, and Khan will remain free pending the outcome of the appeal. Soli Sorabjee, a legal expert, said it was normal for bail to be granted in such a case, and didn't see Khan getting any special treatment from the court. "This has nothing to do with Khan's personality as an actor," he said. The 52-year-old Khan has starred in more than 90 Hindi-language films. But he has also had a reputation as a Bollywood bad boy, known for his run-ins with the law — including a fatal car accident — and his troubled relationships with women. His biggest Hindi films include Hum Dil De Chuke Sanam (I have fallen in love), Sultan (Ruler), Ek Tha Tiger (There was a tiger) and Tiger Zinda Hai (Tiger is alive). Khan spent a total of 18 days in prison in 1998, 2006 and 2007 in the poaching cases, but was freed on bail. He had been sentenced to prison terms of between one and five years in related cases before being acquitted by appeals courts for lack of evidence. The blackbuck is an endangered species protected under the Indian Wildlife Act. The Bishnoi, a religious sect whose beliefs include worshipping nature and wildlife, and who have long protected the blackbuck deer, expressed disappointment at the acquittal of the four other actors. Khan has faced other charges in the past. In 2014, the Mumbai High Court acquitted him in a drunken-driving, hit-and-run case, after he was accused of running over five men sleeping on a sidewalk in 2002, killing one of them. The judges found that prosecutors had failed to prove charges of culpable homicide. The government of Maharashtra state has challenged that acquittal in the Supreme Court.